Our new partnership with Clairvaux MacKillop College is off to a great start. 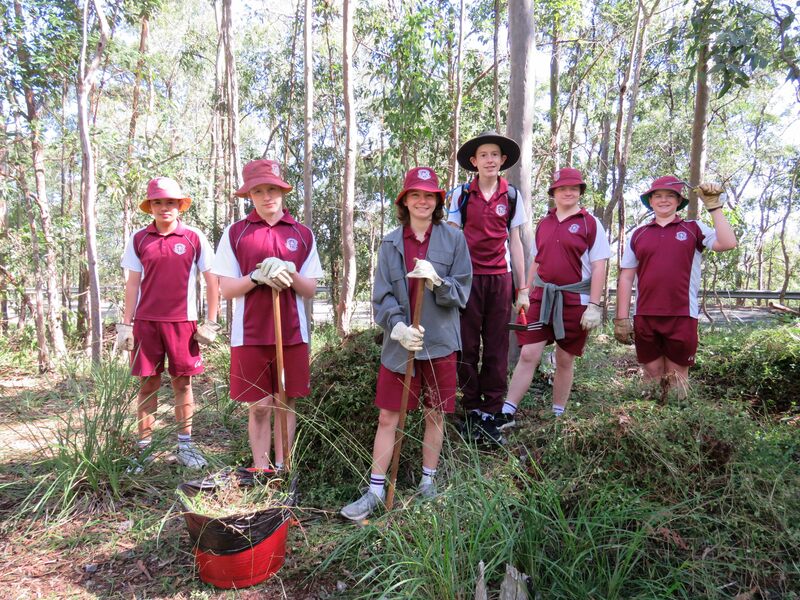 Clairvaux Bushcarers joined us last Monday to help prepare the 2018 National Tree Day site. 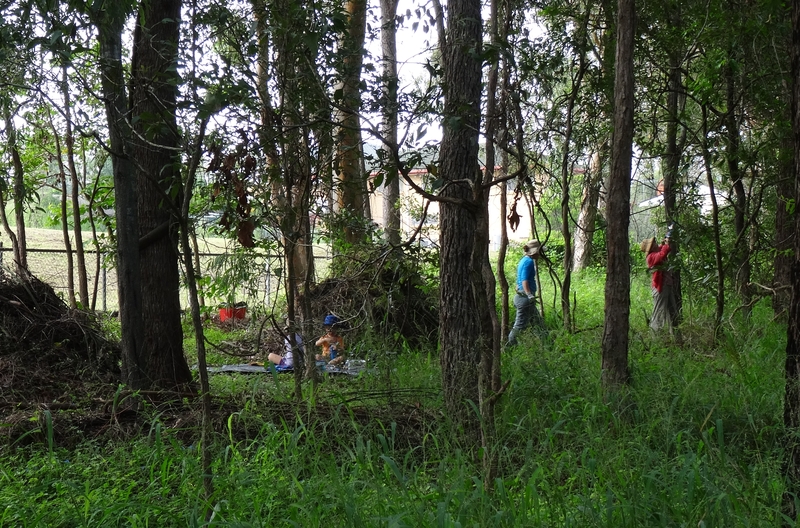 The team worked so hard removing weeds and moving branches to make the site safe, our Tuesday Bushcare group was able to finalise the preparation ready for spreading mulch. It was a real pleasure to work with the students, a bit like herding cats, but still a real pleasure. Over fifty years ago Frederick Herzberg identified recognition and a sense of achievement as two key factors in helping individuals build their motivation. Watching the students’ level of engagement and energy grow as they worked was an excellent example of Hertzberg’s research in action. Removing huge clumps of Guinea Grass Megathyrsus maximus really does provide a great sense of achievement and by removing and bagging the seed heads dramatically reduces weed regrowth. 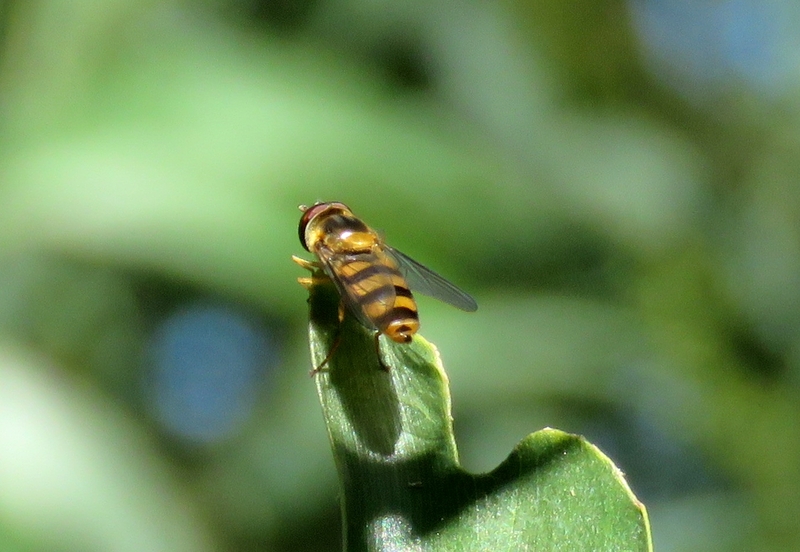 The Clairvaux Bushcarers also had a wonderful time finding “bugs” for me to photograph. 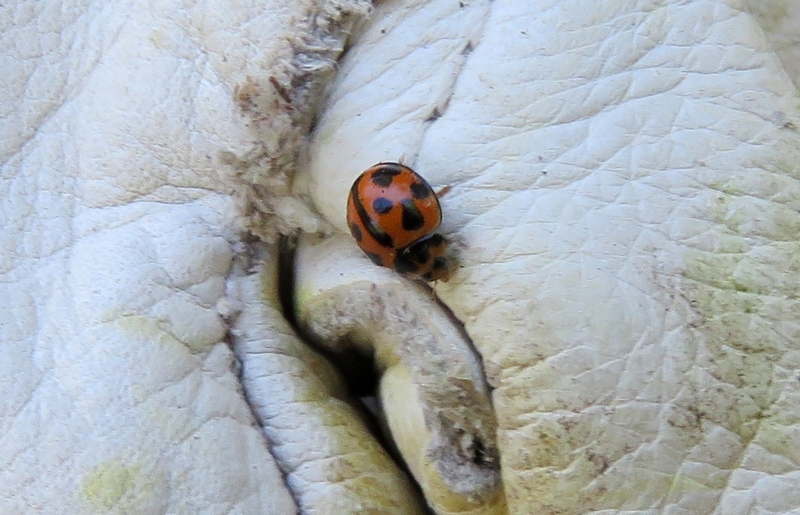 Like this Variable Ladybird Beetle Coelophora inaequalis. 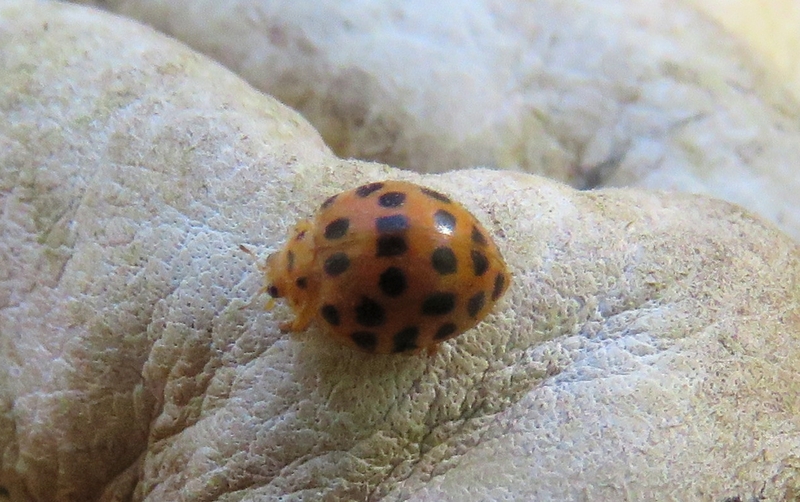 The students also found 26-spotted Potato Ladybird Epilachna vigintisexpunctata which is a new addition to our Flora & Fauna of Mt Gravatt Conservation Reserve. 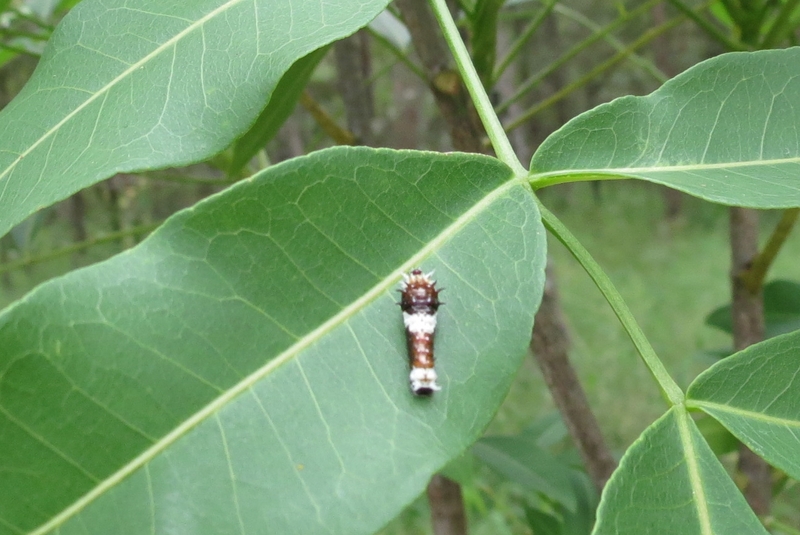 I was also able to introduce the students to the strange looking Ladybird Beetle larvae. 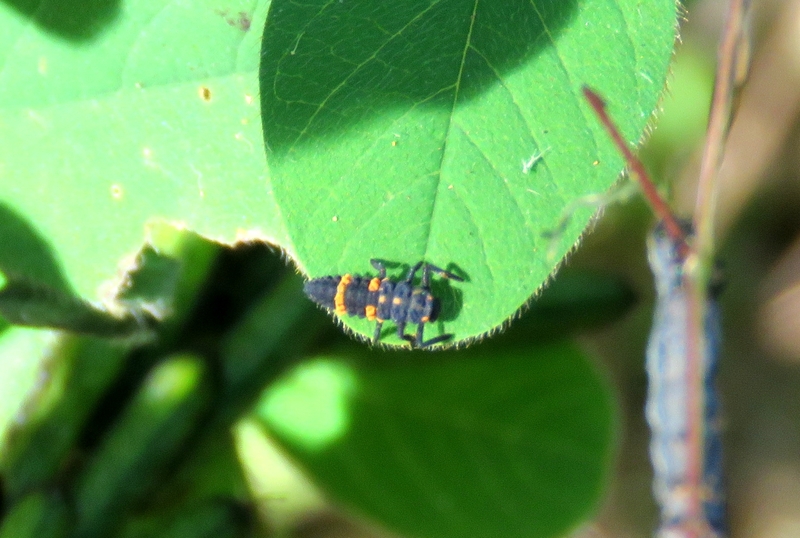 Variable Ladybird Beetle Coelophora inaequalis larvae. 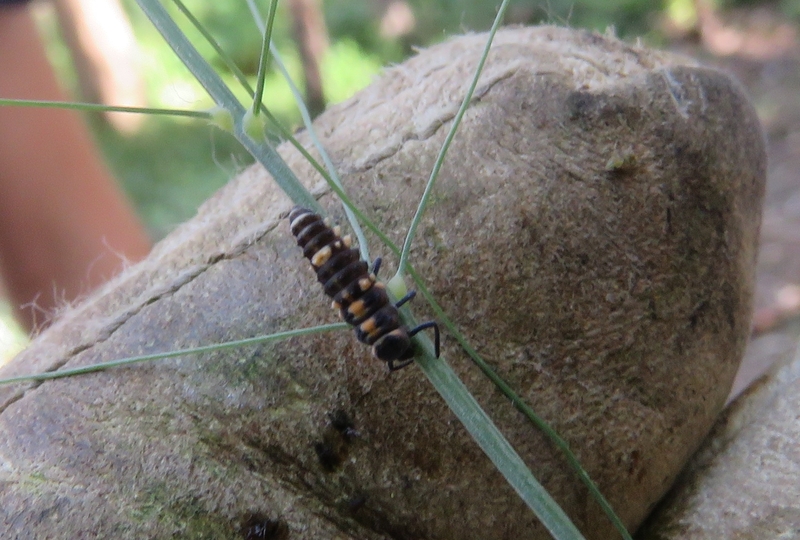 Common Spotted Ladybird Beetle Harmonia conformis larvae. Common Assassin Bug Pristhesancus plagipennis 5th Instar. 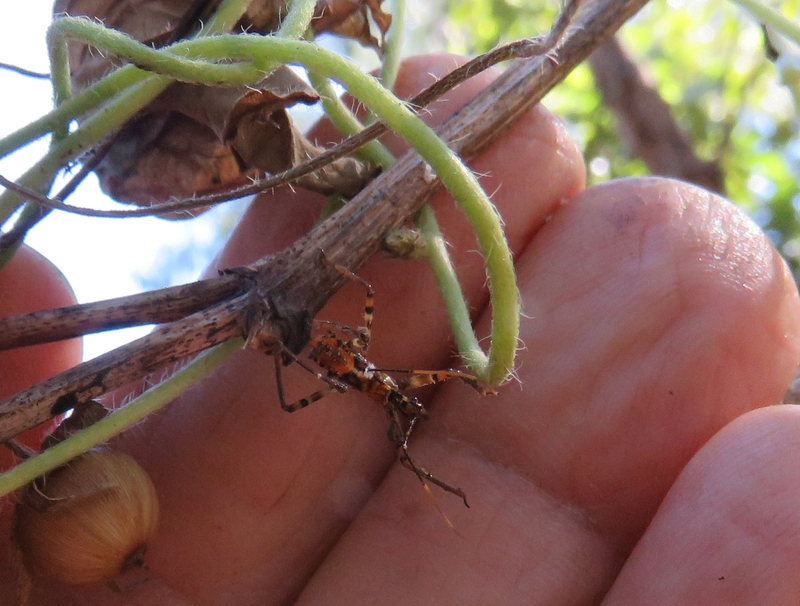 As the name suggests Assassin Bugs are pest controllers for your garden feeding on spiders and other insects. Common Methana Methana marginalis large nymph. 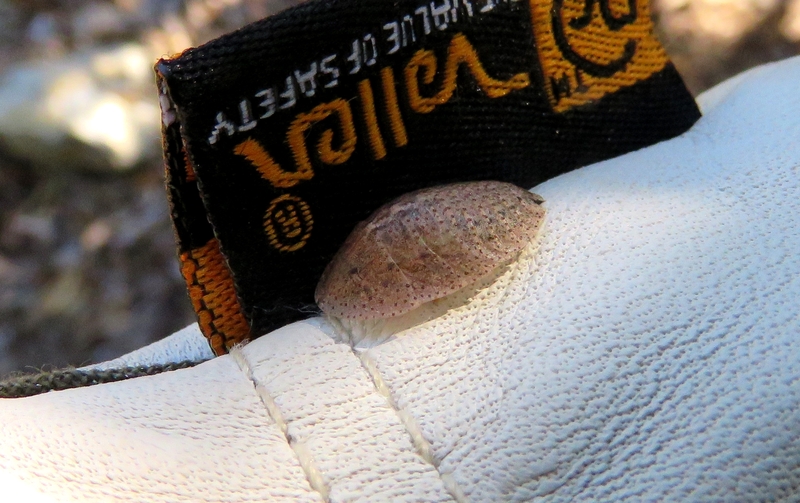 A native cockroach, the Common Methana are great recyclers turning leaves into soil and food for lizards and birds. Bark Cockroach Laxta sp. are another curious native cockroach working hard to recycle leaf litter. 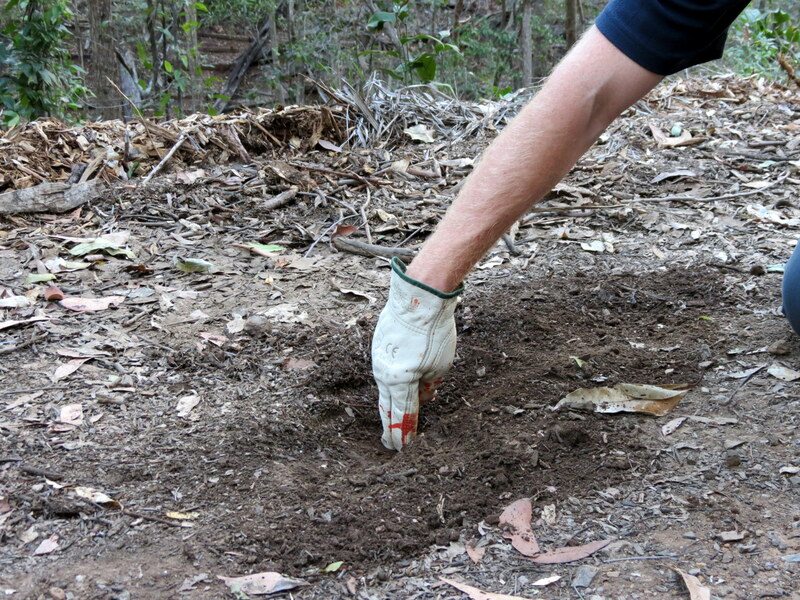 The Clairvaux Bushwalkers helped the previous week, removing Creeping Lantana Lantana montevidenses* (the asterisk * is used to identify non-native species). 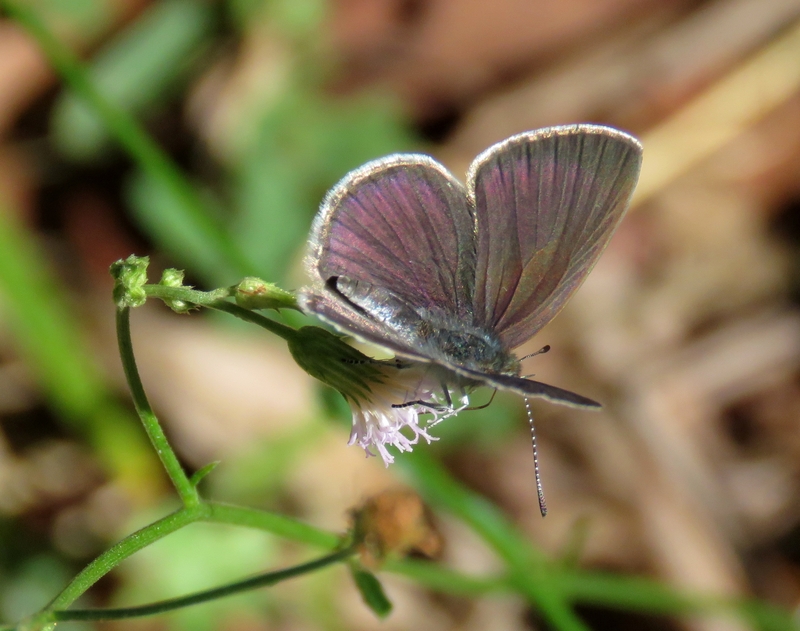 Small Dusky Blue Candalides erinus butterfly feeding on nectar from the flower of a Purple Fleabane Cyanthillium cinereum. Look for the proboscis: a hollow drinking straw the butterfly unrolls. Natives like the Purple Fleabane are returning as Creeping Lantana is removed. 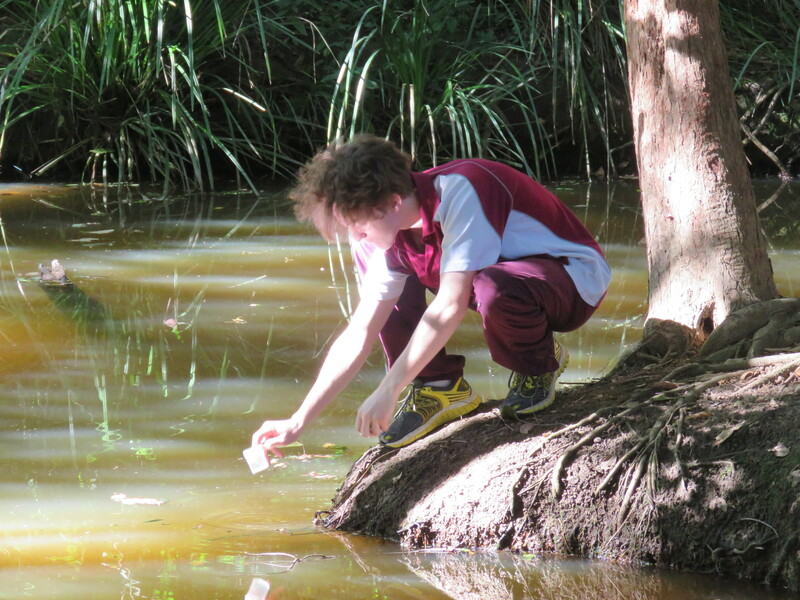 On Friday we hosted the Clairvaux Scientists who checked water quality in Mimosa Creek. 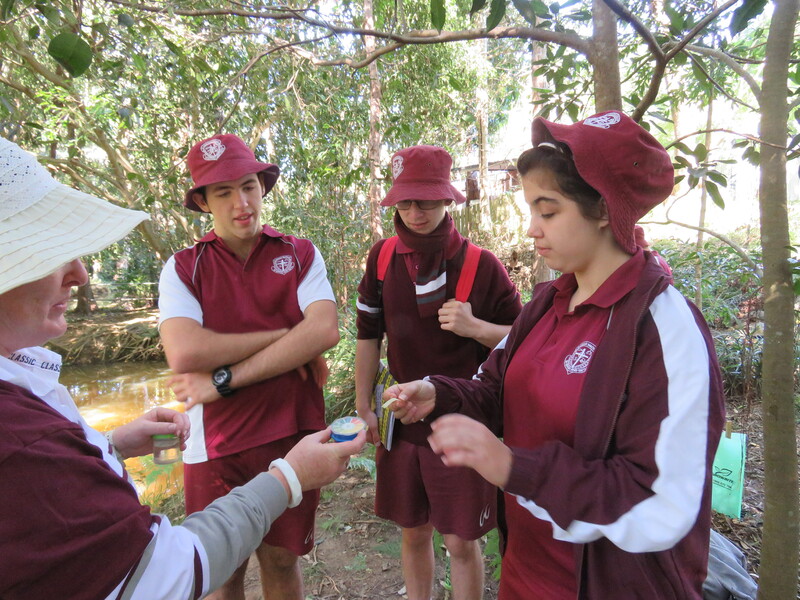 The water sample was then tested with litmus paper which established a healthy neutral water. Thank you to all the Clairvaux students and staff. 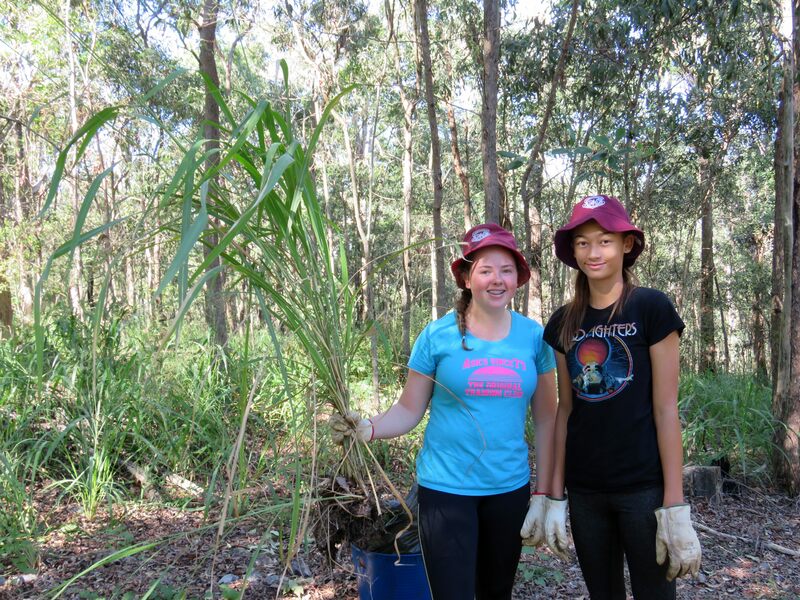 I am looking forward to growing a long partnership restoring Mt Gravatt Conservation Reserve and learning environmental skills. Best bike ride/walk in Brisbane? 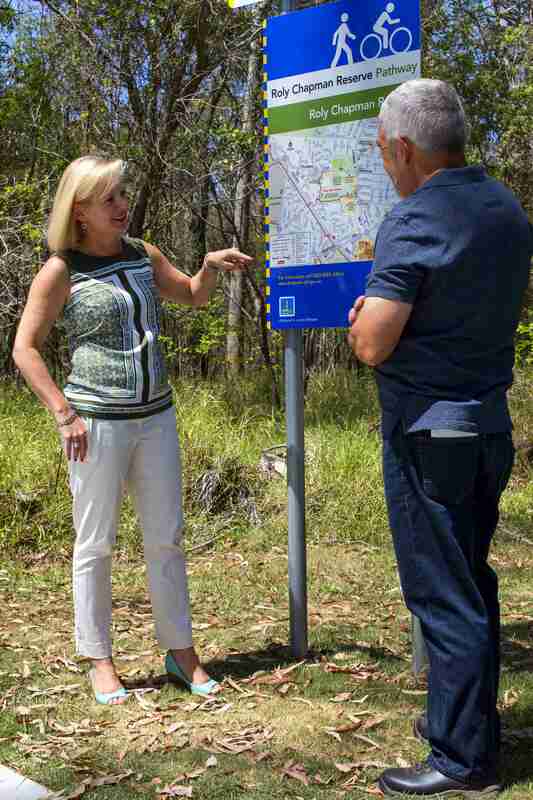 If you want a gentle walk or ride though the bush, Roly Chapman Bushland Reserve is worth a visit and the new cycle path crossing Mimosa Creek expands community access to this special place. Walking through the Reserve last Friday morning with Liz Pell, restoration project leader and Kate Flink, BCC Habitat Brisbane, was particularly special as I was immersed in a world filled with the scent of honey from the flowering Willow Bottlebrush trees Callistemon salignus and the chattering of dozens of Rainbow Lorikeets Trichoglossus haematodus drunk on the nectar. 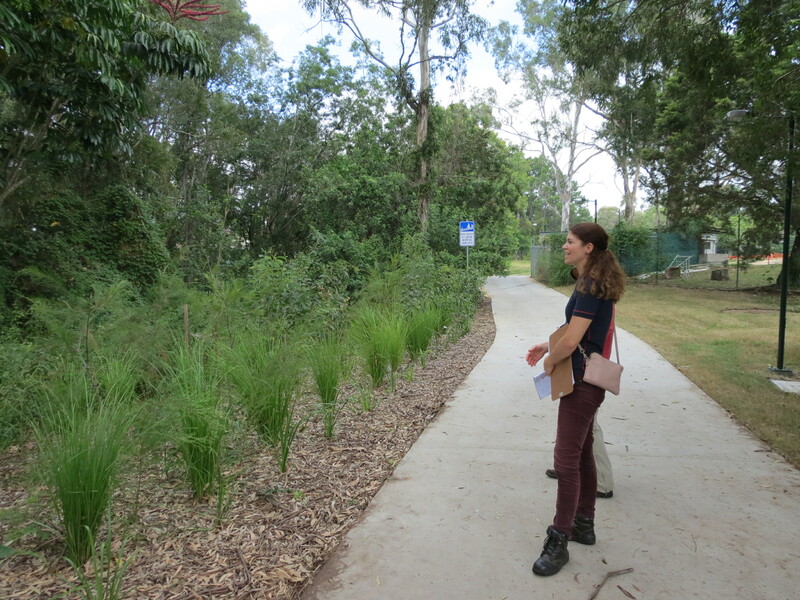 Roly Chapman Bushland is very different to Mt Gravatt Conservation Reserve because it has permanent water flowing though Mimosa Creek. Walk quietly as you cross Mimosa Creek. 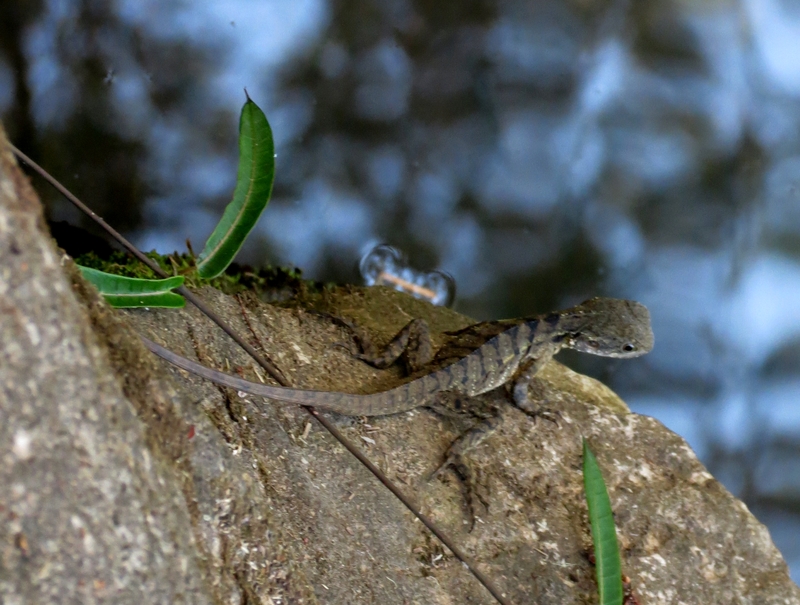 It is common to see turtles in the creek, Eastern Water Dragons Pogona barbata sunning on the rocks. 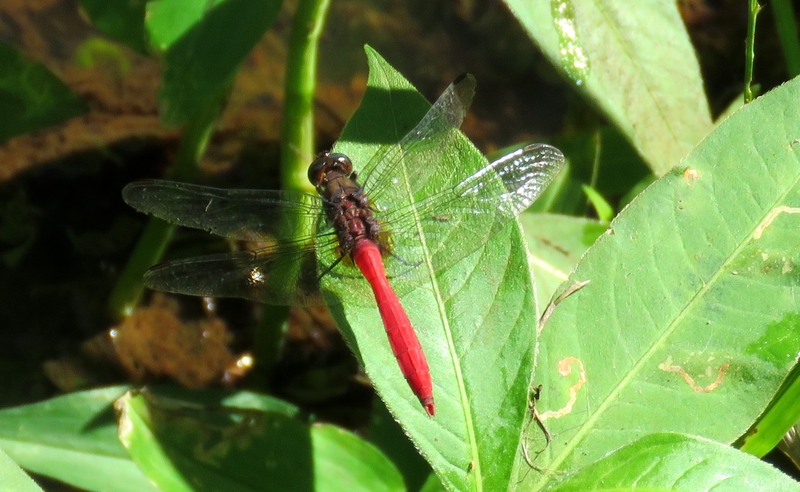 Last Friday Dragonflies and Damselflies were also everywhere resting on leaves or skimming over the water. The new cycle path is a credit to the Brisbane City Council Bikeways Project team and the contractors who did the work. The BCC designers minimised the impact on this sensitive habitat. The new track weaves to reduce loss of trees and, at the same time, creating an interesting and pleasant route instead of a straight strip of concrete. Even the installation of cabling for lights minimised impact on trees by using vacuum excavation around the roots. The quality of the restoration planting is evidenced by seeing virtually no damage after the flood water over the track in January. None of the new Lomandras were lost and the fibre matting is hardly disturbed. Further along the track only one of the new trees has been lost – we normally consider anything than 80% survival is very good for restoration planting. Orchard Swallowtail Papilio aegeus butterflies are already breeding on the advanced Crow’s Ash Flindersia australis planted. Our Roly Chapman restoration team has made good progress clearing Guinea Grass Panicum maximum, Sword/Fishbone Fern Nephrolepis cordifolia and Easter Cassia Senna pendula from Zone 2. 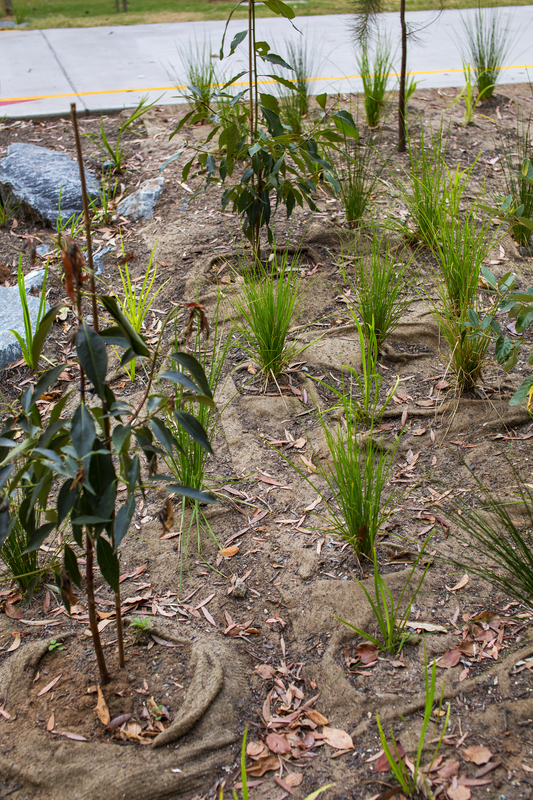 Bushland restoration can be slow as breaking the cycle of weeds retuning means removing seeds and roots left in the ground. Seed heads need to be clipped off Guinea Grass then bagged. Fishbone Fern is particularly slow as all the brown fibrous roots need to be dug up and bagged for removal, leaves can be composted on-site. 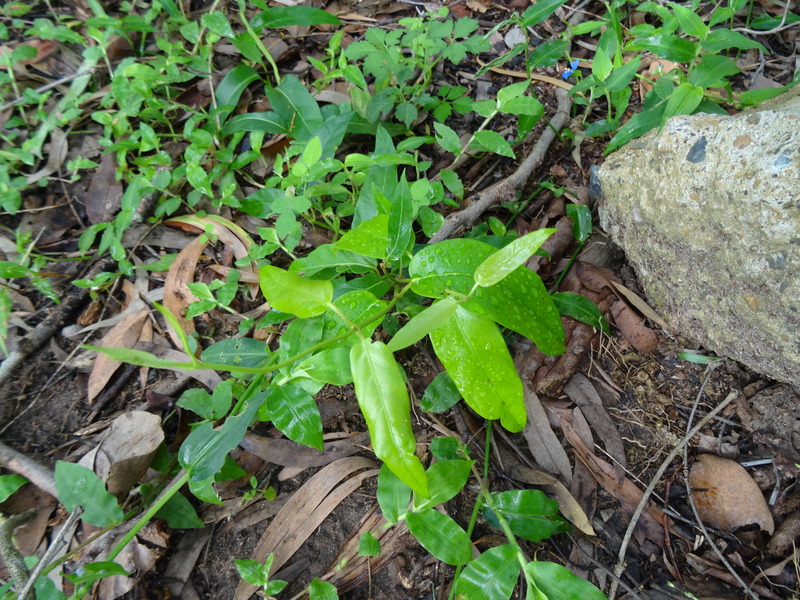 However, watching the natural regeneration of native species provides inspiration to keep going with the work. Each time we come on-site the Slender Grape Cayratia clematidea, Wombat Berry Eustrephus latifolius, Creeping Beard Grass Oplismenus aemulus, Native Wandering Jew Commelina diffusa and Parsonsia vines are returning where the weeds have been removed. Restoration of Roly Chapman Bushland Reserve will take another ten or twenty years however with the new cycle path and bridge over Mimosa Creek this is already becoming a special place to walk or cycle. 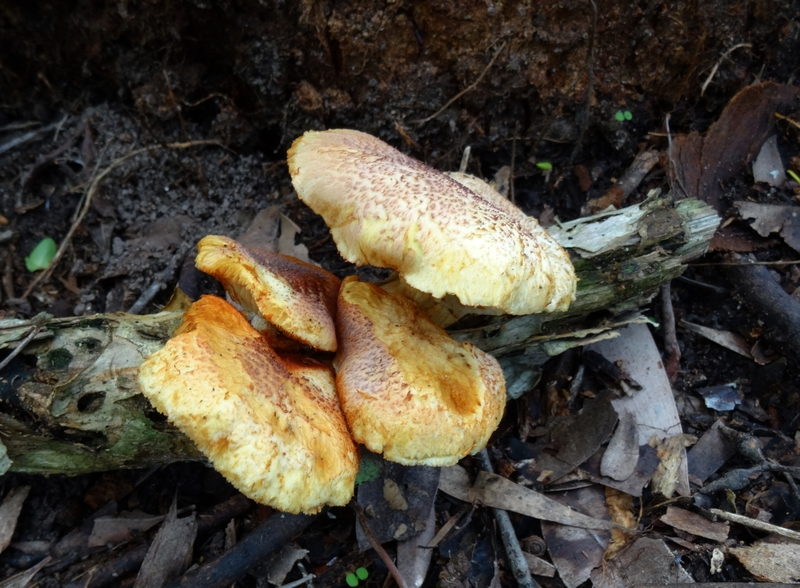 Marshal and I took at walk through the Reserve to check out the fungi that has appeared after the rain. Eastern Water Dragons Physignathus lesueurii and turtles can often be seen beside the causeway across Mimosa Creek. 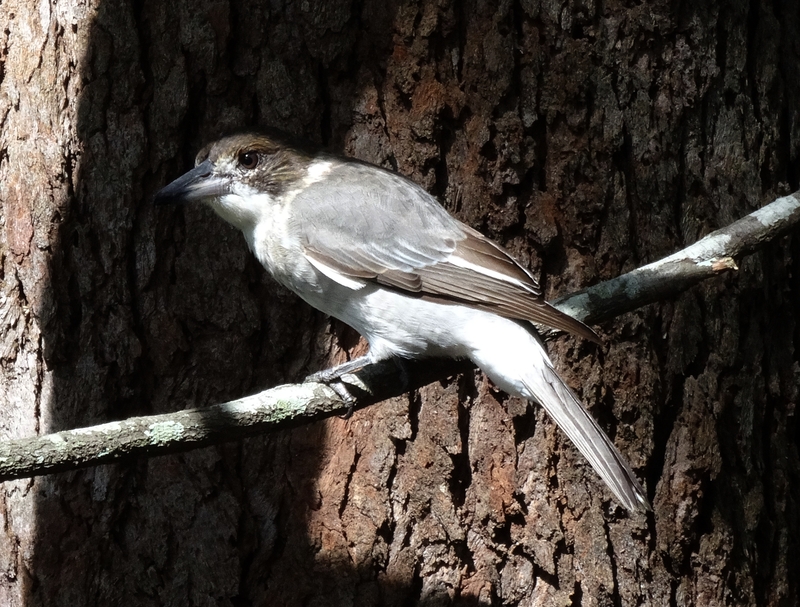 This morning it was just a family of Australian Magpies Gymnorhna tibicen. 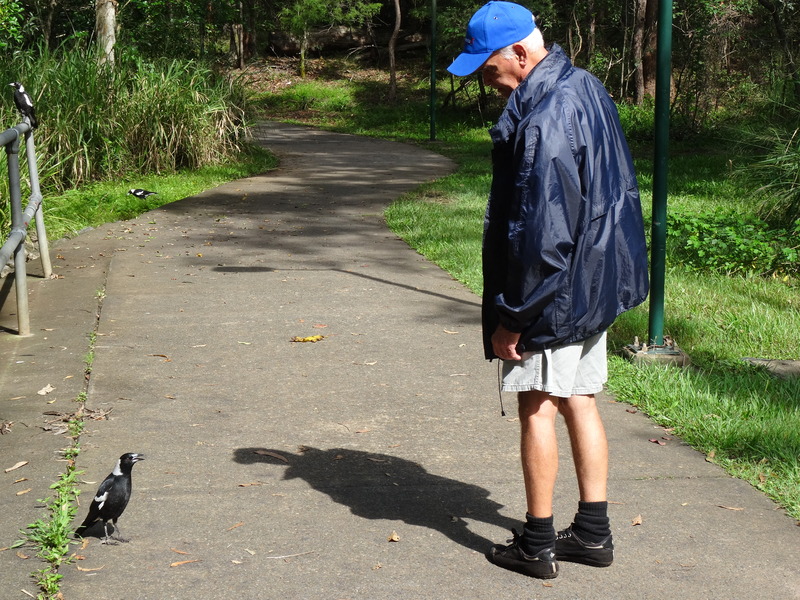 One Magpie was particularly taken with Marshal when he stopped for a chat. 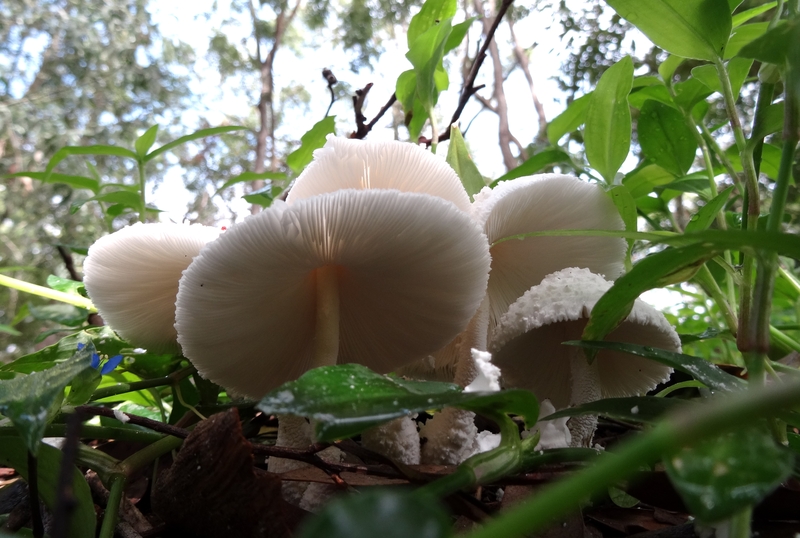 Some beautiful fungi fruit have appeared, like the Yellow Fleshy Pore Fungi with its charismatic underside with pores rather than the more common finned underside. Click on image to enlarge. 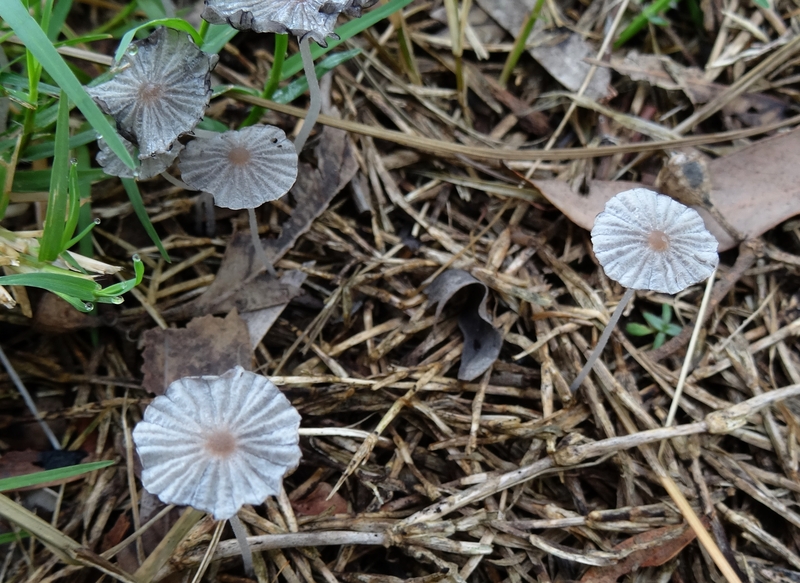 This white gilled fungi is growing out of one the weed composting piles. Gilled fungi cluster on stick. While we are working we always have local wildlife visiting. 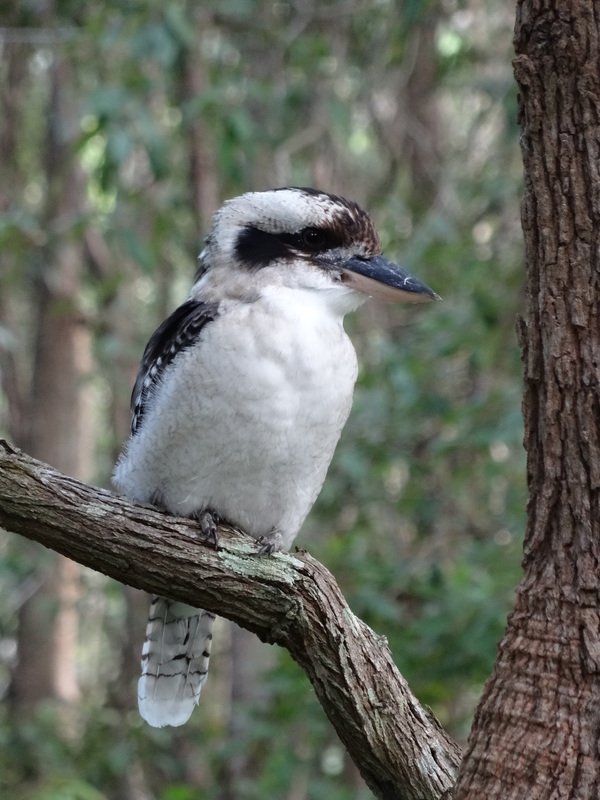 Laughing Kookaburras Dacelo novaeguineae and Grey Butcherbirds Cracticus torquatus arrive as soon as we start clearing weeds exposing small insects and spiders. 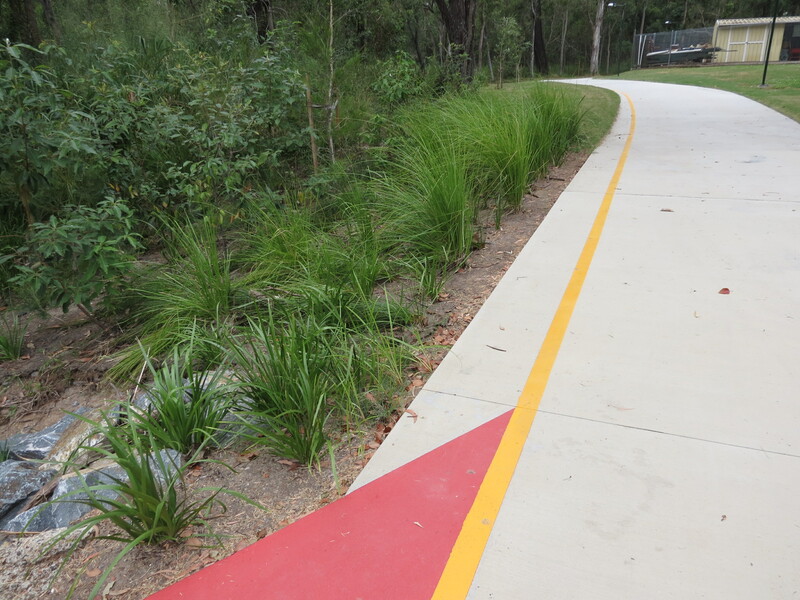 A bike path with “wildlife furniture” in Roly Chapman Bushland Reserve? Inspecting the new bike path through Roly Chapman Bushland Reserve today with Cr Krista Adams, I commented on the professionalism and design sensitivity the BCC Bikeways Project team and contractors working is a sensitive habitat area. 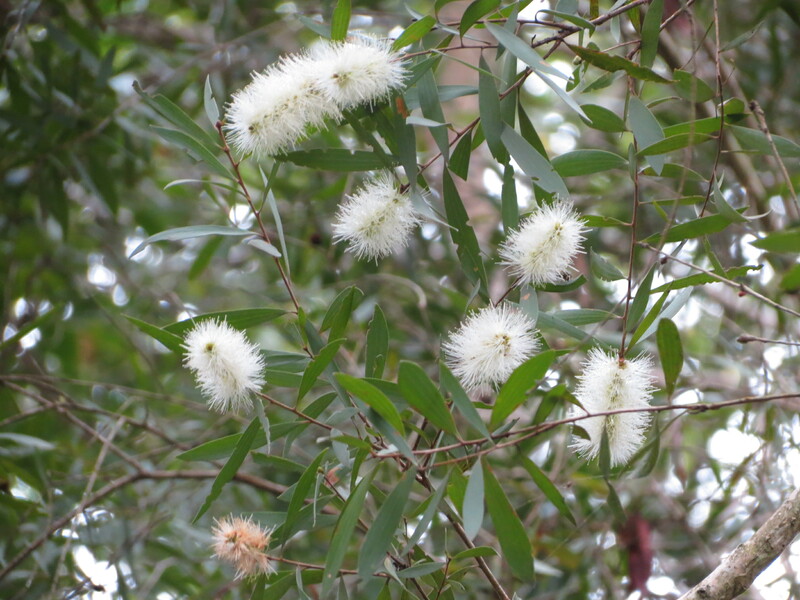 Cr Krista Adams is a strong supporter of our bush restoration work and keen to explore ways to balance pressure of our urban environment with valuable bushland remnant habitat. 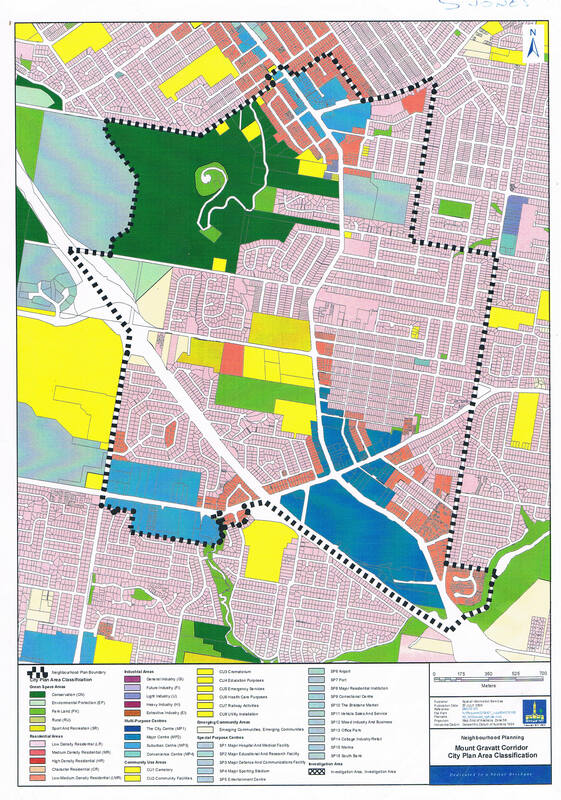 The Mimosa Creek Precinct Landscape Plan identified the bike path will support long term investment in habitat restoration within Roly Chapman Bushland Reserve as community access is enhanced. 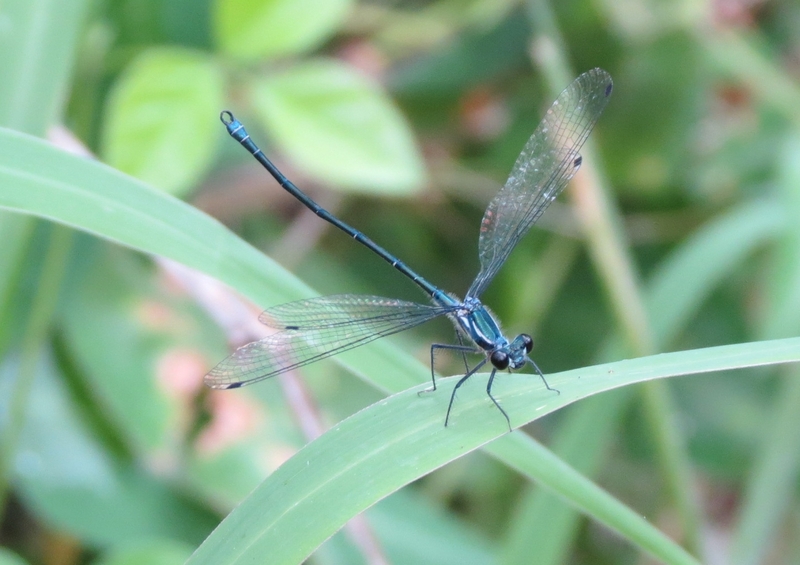 The more community members value the Reserve as peaceful place to walk or ride, the more the City Council can allocate to habitat restoration and building wild life corridors. Connecting with the existing path, near the Hoad Street entry to the Reserve, the new bike/walking path weaves its shady way among valuable Ironbarks, Scribbly Gums and Queensland Blue Gums – Koala’s favorite food tree, before crossing Mimosa Creek to link with the Klumpp Road Park & Ride. 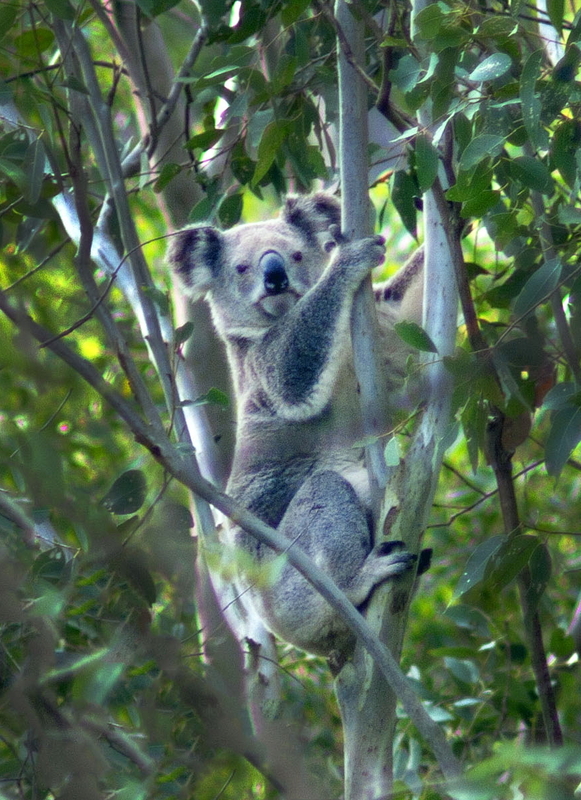 Thoughtful planning has been critical to minimise impacts on vegetation as it is boarded by two significant remnant vegetation communities identified in the 2011 BAMM corridor assessment report. Aside from minimising tree loss with carefully planned curves, the design required the path to be laid above ground to reduce the impact excavation would have on tree roots. Running cabling for lights still required excavation however impact was reduced by use of vacuum excavation around significant tree roots. Were trees did have to be removed the logs were distributed in the bush to create habitat required by species like Echidnas that dig for insects living under fallen timber. 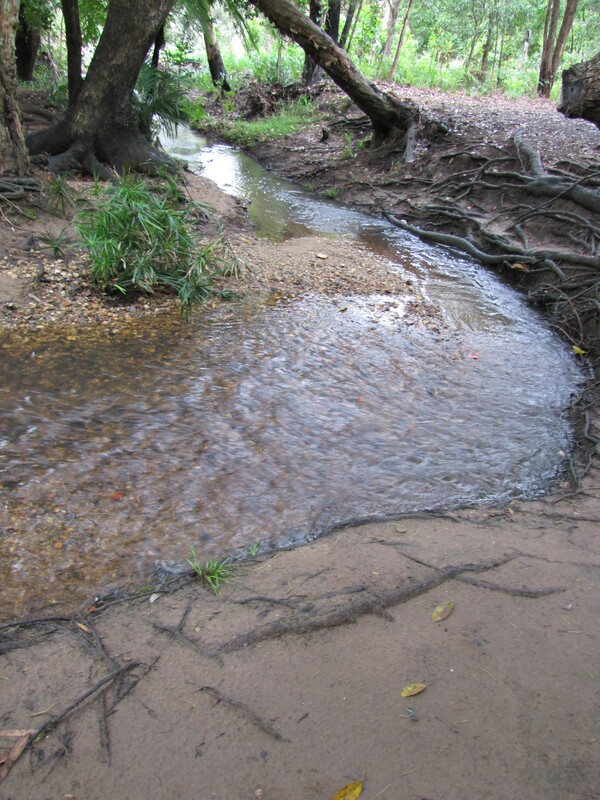 Crossing Mimosa Creek was sensitive and restoration a work particularly important to manage erosion. One bonus was removal of a large area of invasive Balloon Vine Cardiospermum grandiflorum and Madeira Vine Anredera cordifolia, as well as, a large Camphor Laurel Cinnamomum camphora. One unexpected design feature was installation of animal or wildlife furniture in the creek crossing. I had never heard to term “wildlife furniture” before Krista introduced the term when we inspected the creek crossing. 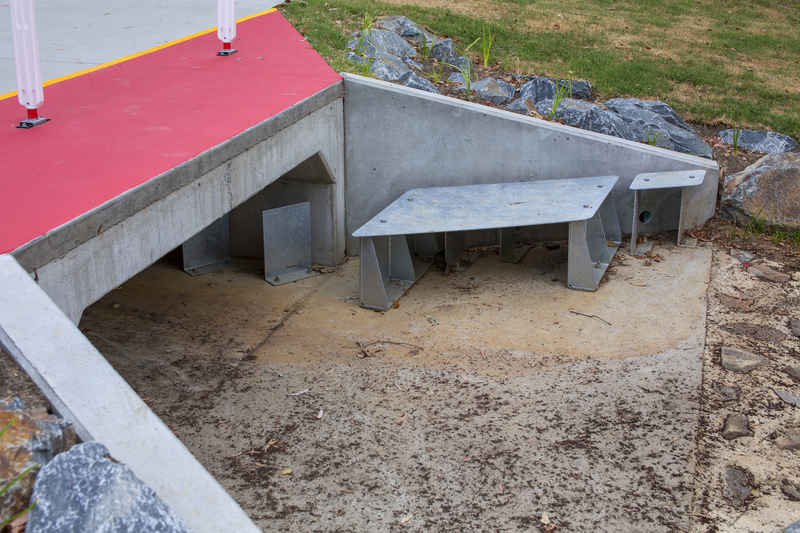 BCC designers draw on a range of “furniture” used to create wildlife corridors for everything koalas and gliders to lizards. In this case heavy water flows in local flood conditions required the installation flow disruptors to allow fish and turtles to move upstream. Working with the huge City Council bureaucracy can be frustrating, however, the size of the organisation means that it also has the capacity to draw on high quality expert teams for projects. I was very proud of our Griffith Mates partners today. Rain and mud did not stop Camilla and Mia. 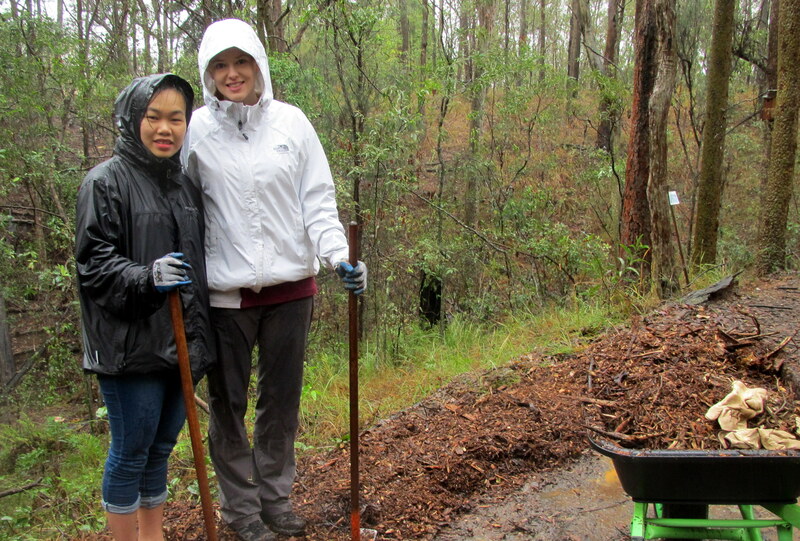 The rain meant it was unsafe to work removing Fishbone Fern on the steeper areas of the gully, so our focus was restoring and strengthening the silt filters along the Farm Fire Trail. The silt filters are proving very effective. 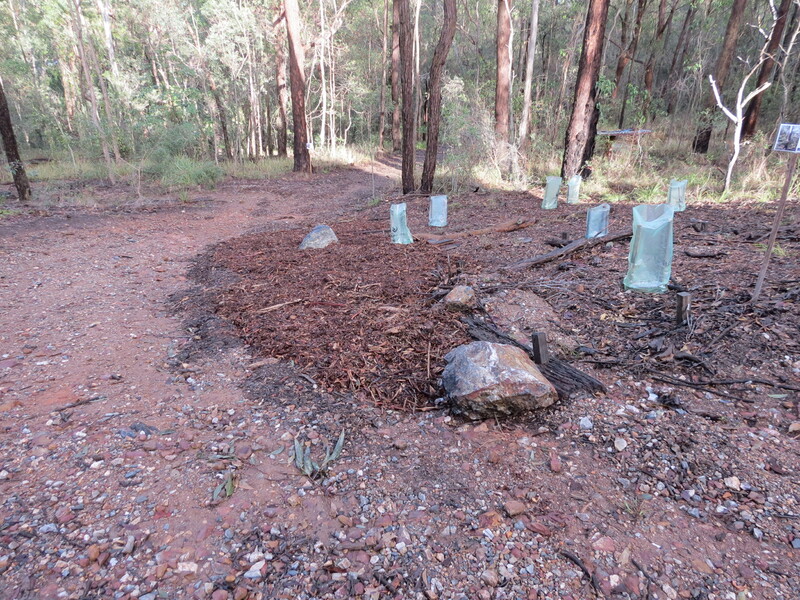 Simon Fox, our BCC Habitat Brisbane coordinator, is impressed with our simple low-tech solution to reduce erosion. Recycled deck timber is used to make stakes and timber barriers to hold the mulch forming the silt filter. 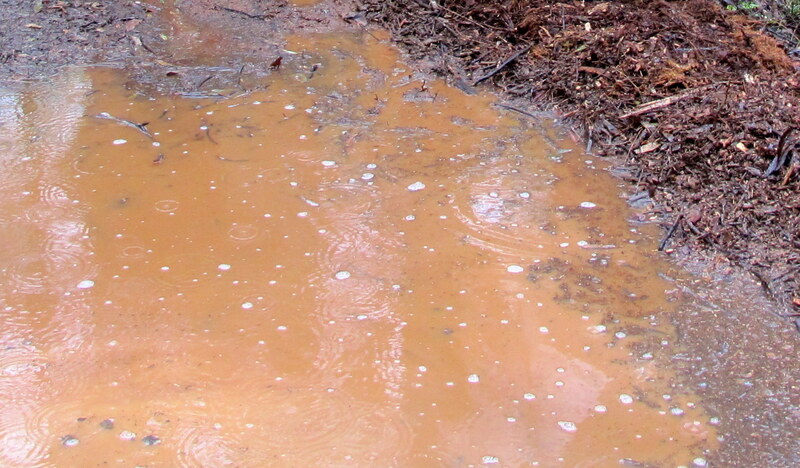 The filters slow muddy water so the silt has time to settle out while the water filters away. 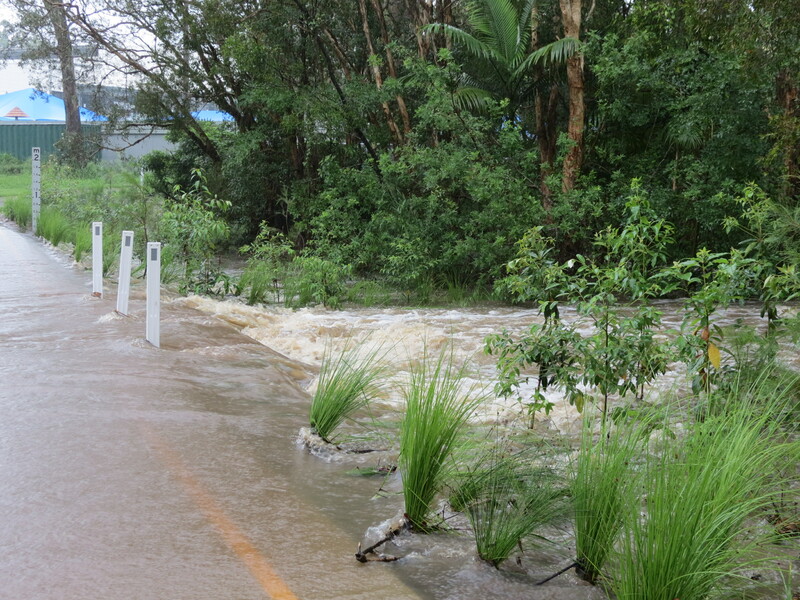 In some areas up to 100mm of silt has been captured and stopped from flowing into Mimosa Creek. 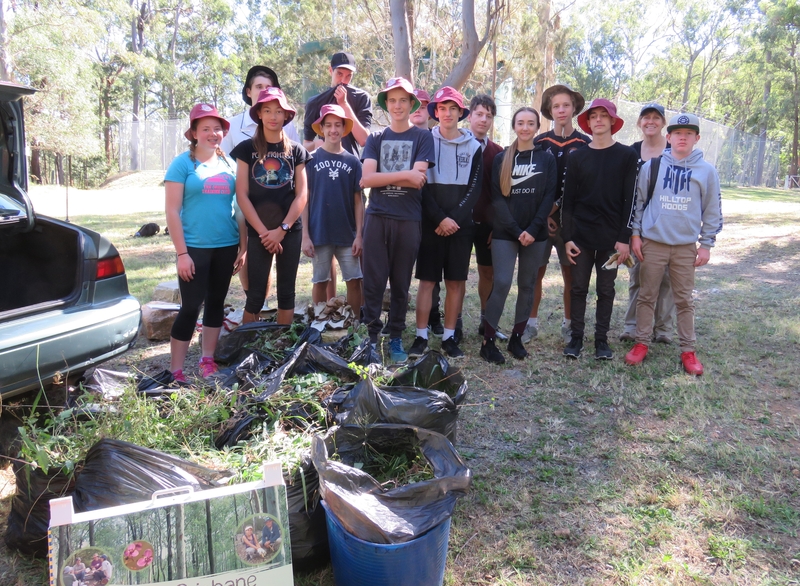 We also restored mulch around the Koala trees Griffith Mates planted for National Tree Day. Camilla and Mia were fascinated by what we found while we were looking for rocks to help manage erosion. The first two rocks we turned over we found ant nests so we carefully restored their home. 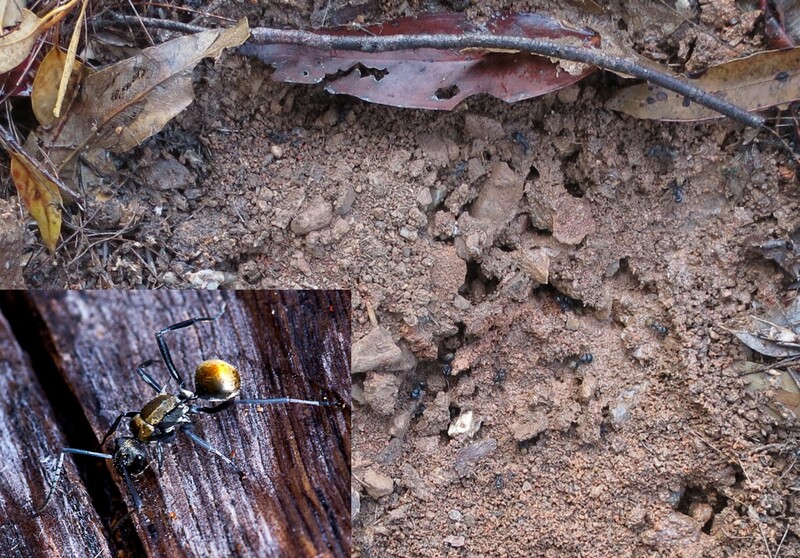 The first nest was a Golden-tailed Spiny Ant Polyrhachis ammon. When they named it spiny they were not kidding. 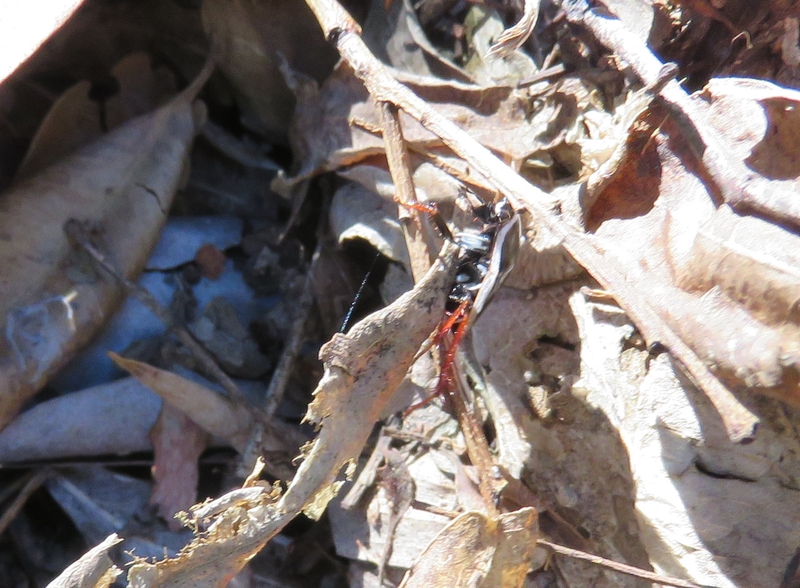 Aside from the spines over the head and caster (tail) this ant has extraordinary sharp horns on the body. 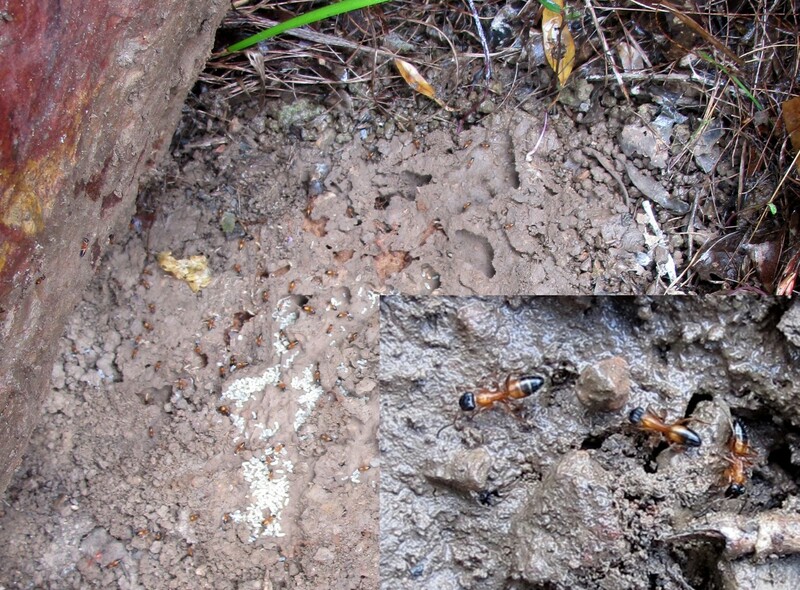 Under the second rock we found a new ant to add to the species list for the Reserve. Black-headed Strobe Ant Opisthopsis rufithorax. Enough work. Time to get out of the rain, have a hot drink and warm up. 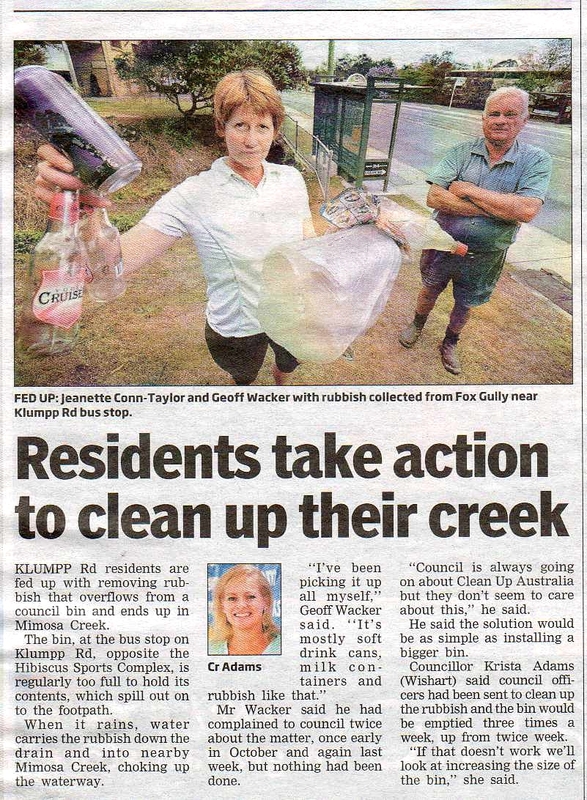 Geoff and Jeanette are proud of our community and take great pride in their part of the Fox Gully corridor. So it is understandable that they get a bit frustrated with the careless behaviour of individuals rubbishing our streets, particularly when that rubbish will be washed into peaceful Mimosa Creek. Changing the behaviour of individuals waiting for a bus stop can be difficult. However, an important step is to ensure that there is a simple alternative for disposing of their drink bottle or chip packet. Cr Krista Adamshas now committed Council to ensuring that the bin is emptied regularly and possibly replaced with a larger bin. Ideally a combination rubbish recycling bin. Mimosa Creek, Roly Chapman Reserve just behind PCYC. 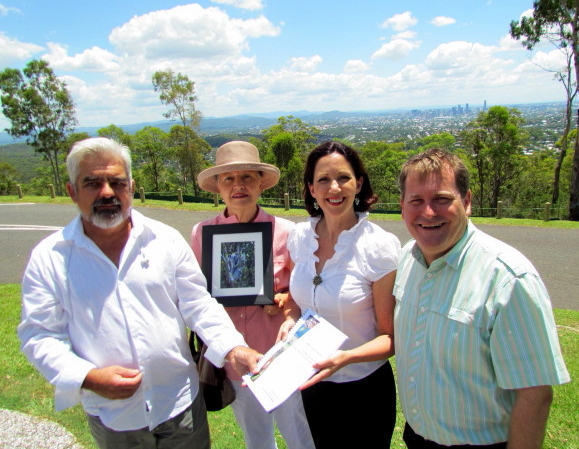 Wednesday 15th, Sue Jones and I joined Hon Vicky Darling MP, Minister for Environment and local member Hon Phil Reeves MP, Minister for Child Safety and Sport at Mt Gravatt Lookout to officially present the independent environmental report: Mimosa Creek Precinct – Flora, Fauna and Fauna Corridor Assessment, Biodiversity Assessment & Management Pty Ltd – Nov 2011. Like many visitors Minister Darling was pleasantly surprised by Mt Gravatt Lookout, the view over the CBD with the ranges beyond, Echidna Magic Cafe and picnic area all within a unique habitat which is home to Koalas, Echidnas and forty five butterfly species. With two hundred and sixty-three native plant species this unique 66 hectares has 10% of the species diversity of the whole 22.6 million hectares of Great Britain. 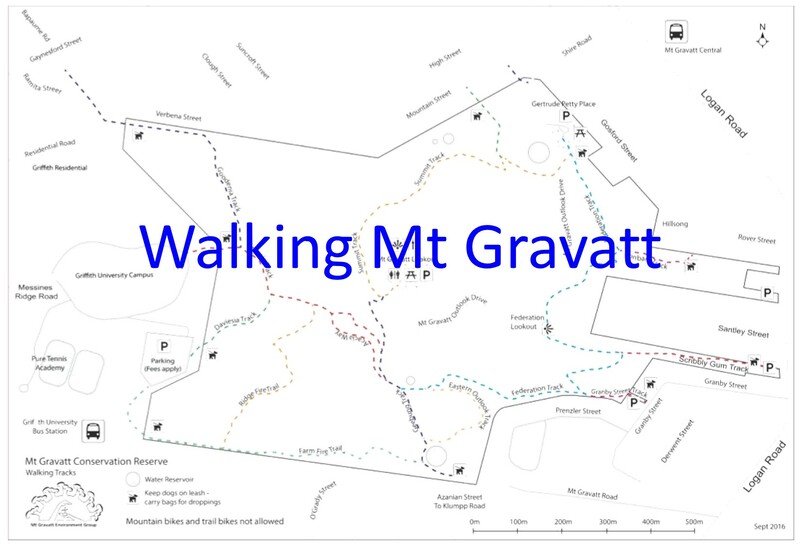 Delivering this report is another step in a process that started in July 1893 when, in response to community action, Mt Gravatt was declared an environmental reserve. Prior to that Mt Gravatt and surrounds were designated as a railway timber reserve. In 2012 the problems are different but whole of community action is more vital than ever as we work to build long term security for this extraordinarily diverse habitat by engaging private property owners, community groups, university and school as well as local and state government departments in a collaborative effort to restore vital wildlife corridors. 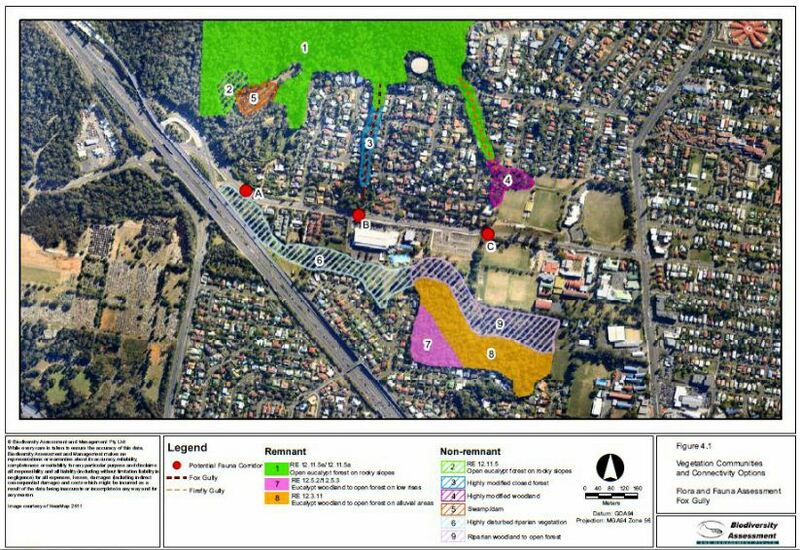 Therefore Mt Gravatt Environment Group initiated this report as an independent ecological assessment of the areas of Mt Gravatt Reserve and Roly Chapman Reserve covered by our Mimosa Creek Precinct Landscape Plan, including potential wildlife corridors links. 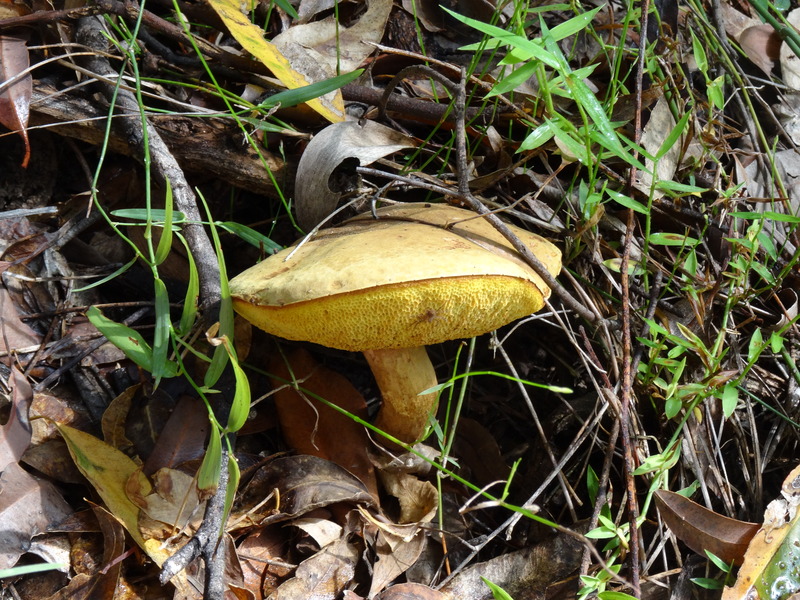 The report was half-funded by an $8,000 State Government grant which was matched by in-kind support from researchers Biodiversity Assessment & Management Pty Ltd.
Of Concern habitat – Vegetation Community 8 (orange). 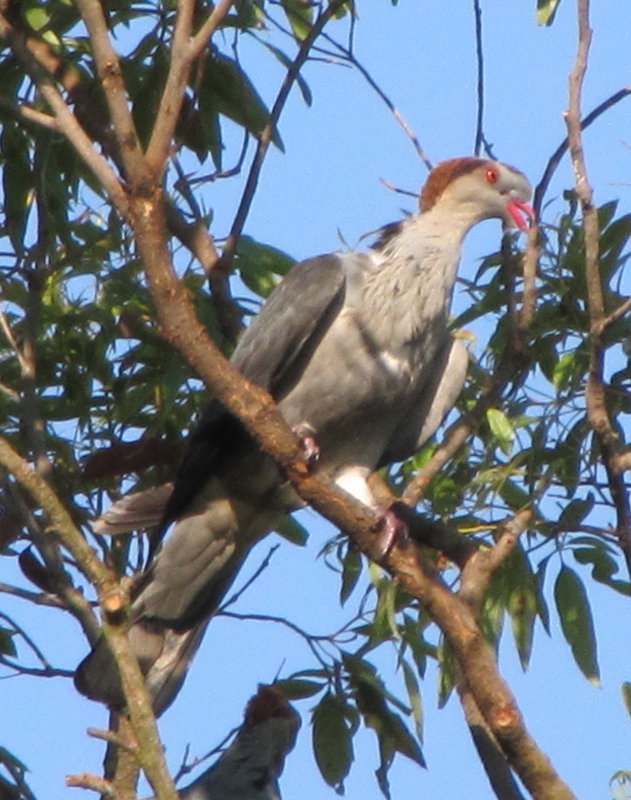 can potentially be restored by habitat restoration allowing natural regeneration. Eastern Bentwing Bat Miniopterus oceanensis. Ground fauna, particularly mammals, have suffered series declines.